Walking distance to the Bass Harbor Lighthouse, located on the quiet side! 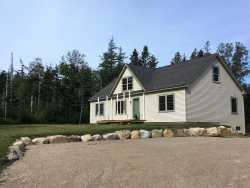 Brand new house, walking distance to the Bass Harbor Lighthouse in Acadia National Park. This one story, three bedroom, two bath is the perfect retreat. The floor plan is open with a living room with flat screen TV, dining room and kitchen. The master bedroom has a queen bed and private full bath with a large shower. The eastern end of the house has an additional queen bedroom, and bedroom with two twins. The bathroom has a tub/shower. The washer and dryer are accessible on this floor. There are chairs and a fire pit in the backyard. Photos of the front porch will be posted upon completion. 3 night minimum May, June, September, October. Weekly only July and August. Pets considered. $100 pet fee. Included in your quote is the rental rate, the state lodging tax and our processing fee, A Refundable $400 Security Deposit is also added to your lease.